Eating tomatoes is forbidden because they are Christian. 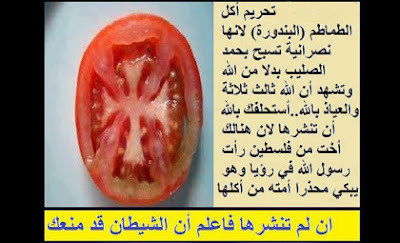 [The tomato] praises the cross instead of Allah and says that Allah is three (a reference to the Trinity). [God help us]. I implore you to spread this photo because there is a sister from Palestine who saw the prophet of Allah [Mohammad] in a vision and he was crying, warning his nation against eating them [tomatoes]. If you don’t spread this [message], know that it is the devil who stopped you. Muslims get absurd Facebook chain mail, too, I see.